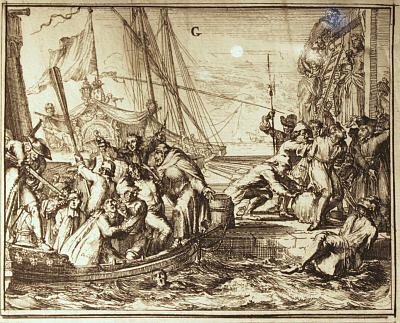 G. Huguenots are being tortured and killed on board a ship and on land. Their hair and their ears are being cut off. Chained to heavy stones, they are being flung into the water. Some of them are throwing themselves at the feet of an officer or Intendant, pleading in vain for mercy.